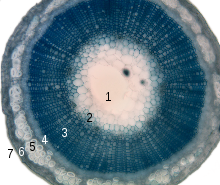 A cortex is an outer layer of a stem or root in a plant, lying below the epidermis but outside the vascular bundles. The cortex is composed mostly of large thin-walled parenchyma cells of the ground tissue system and shows little to no structural differentiation. The outer cortical cells often acquire irregularly thickened cell walls, and are called collenchyma cells. Some of the outer cortical cells may contain chloroplasts. It is responsible for the transportation of materials into the central cylinder of the root through diffusion and may also be used for food storage in the form of starch. The innermost layer of the cortex is the endodermis. ^ Allaby, Michael (2019). "A Dictionary of Plant Sciences". Oxford University Press. doi:10.1093/acref/9780198833338.001.0001. Retrieved 19 April 2019. ^ a b Hine, Robert (18 April 2019). "A Dictionary of Biology". Oxford University Press. doi:10.1093/acref/9780198821489.001.0001. Retrieved 19 April 2019.